Already a master thief, young Clapham has nearly given up the fight against his black heart. “My Pa’s taught me all about thievin’. It’s in my bloodline… ain’t no escapin’ it.” Those are the words he lives by and he almost believes them. But a steadfast friend will show him that no one has to be a prisoner of their past. Trapped in a life of thievery, Clapham is faced with a choice. Will he choose to steal from his friends? Will betrayal rob a faithful friend of his loyalty and forgiveness? 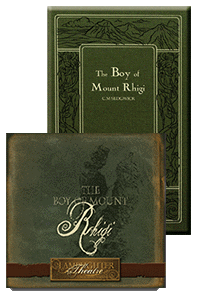 Join us for The Boy of Mount Rhigi - a heartening story with unexpected twists and turns that will keep all ages on the edge of their seats! From Anonymous of SA, Texas on 2/22/2017 . This story is great!!! I absolutely loved it and listened to it every night before I went to bed for a long time! The girl dying so boldly caused me to think twice about my faith and really can draw someone closer to the Lord! From Betty Christy of Williamson,, New York on 1/2/2015 . I gave this to my granddaughter for Christmas. I heard it on Lamplighter Theater on the radio and really enjoyed it, thus my decision to give it to my granddaughter. From Sheri Mowery of Cleveland, Tennessee on 4/23/2014 . The story was great and the audio cd was superb!